Have you ever wondered what a typical day on board Intrepid was like? A Plan of the Day outlined the ship’s daily schedule, noting events such as religious services or movies and disseminating general information. This Plan of the Day announces a “Holiday Routine” for this date, which was Good Friday in April 1966. 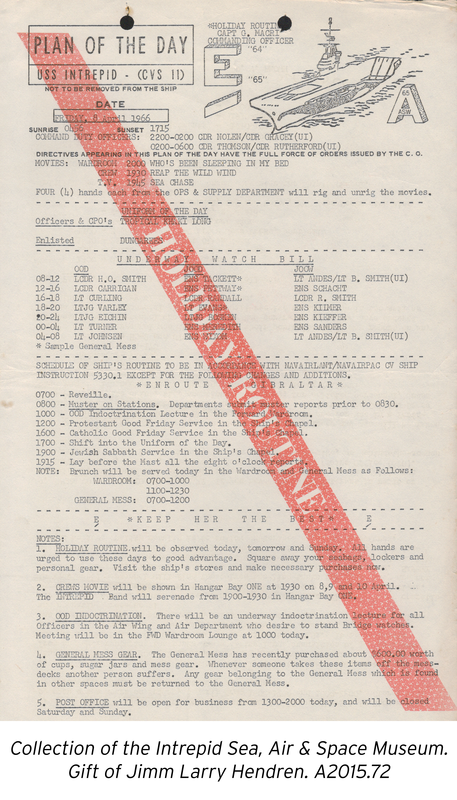 This Plan of the Day and many other documents are part of the Intrepid Museum’s archives. Archives are an extremely important part of our collection here at the Intrepid Museum. But what is an archive? Archives are any two-dimensional works on paper from a single creator. This includes letters, ship newspapers, manuals, diaries and other ephemera that crewmembers may have picked up during their service. These personal papers give us a glimpse into the lives of Intrepid’s crew members. Did you know that a portion of our archive is online? 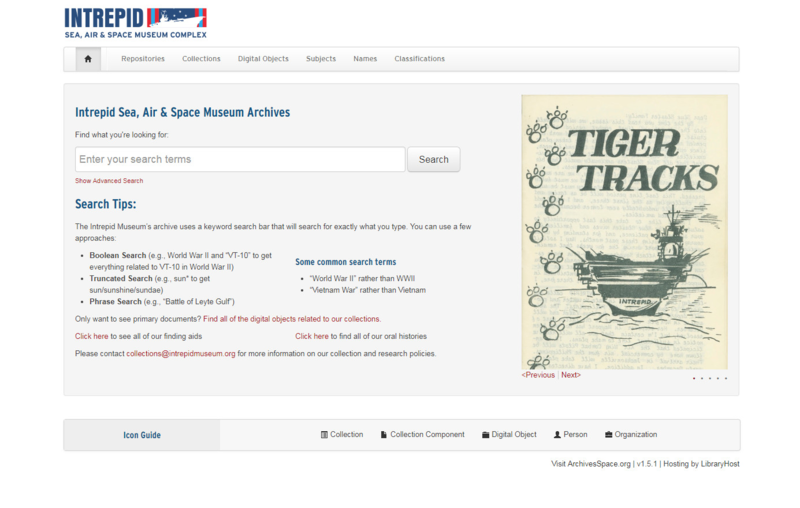 The Intrepid Museum’s online archive includes our finding aids and oral history transcripts. A finding aid is a document that describes the content scope of an archival collection. Many archival finding aids are accompanied by scans of important documents within that collection. These are identified as digital objects and can be found under “Instances.” Currently, we have a selection of our archives and oral histories online, but we are continuously updating and adding to our online collection. You can access the archives by clicking the “Search the Archives” link on the Museum’s collections page. There, you will find a search bar and a home page with some helpful search tips. While the archive can be searched by using keywords, it is important to be specific in your search, as the website will not recognize any shorthand terms. When you search for a keyword in the Museum’s archives, several icons will appear next to each result. Each icon represents what type of record the result is. Here's a quick guide to understanding the icons and terminology found on the online archives to help you navigate the website. “Collections” refers to each separate collection of papers we have, specific to a donor. “Components” are the subseries or items found within a collection. “Digital Object” is the PDF scan of the items in each collection. “Person” refers to the historic owner, donor or related name within a given collection. “Organization” refers to a larger body or corporate entity related to a collection, such as NASA or British Airways. If you haven’t found what you’re looking for in the online archives, ask us! This research request form will give us all the information we need to help you in your search. Our archive has many amazing stories to tell. You may want to read the diary of Ray Stone, a radarman on board Intrepid in World War II, who survived kamikaze attacks; search through the training papers of Shaun O’Shaunessy, a Growler missile technician; or browse Intrepid’s cruise books, which are like yearbooks for the ship. What will you discover?